All the supplies listed below with links are my personal preference and I have not received any compensation for posting them. I’ve been having fun experimenting with air dry clay and I’ve learned a few tips and tricks that I’d like to share with you here in this tutorial for some seasonal appropriate air dry clay napkin charms. You can also tie these charms to center pieces, wine bottles, or any other gift you might be giving this season. Air dry clay– I bought an entire 10lb box in terra cotta and it is going a long way. You can start with a much smaller quantity. Since we will be painting them, the color does not matter. 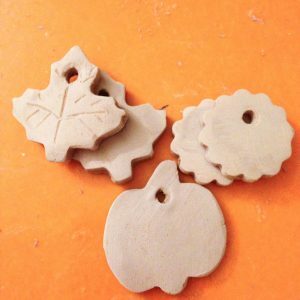 Clay tools– You will at least need a rolling pin to roll out your clay, and something to put the holes in the top of the charms, a straw works great. I have these inexpensive tools from Sculpey that I am having good success with. 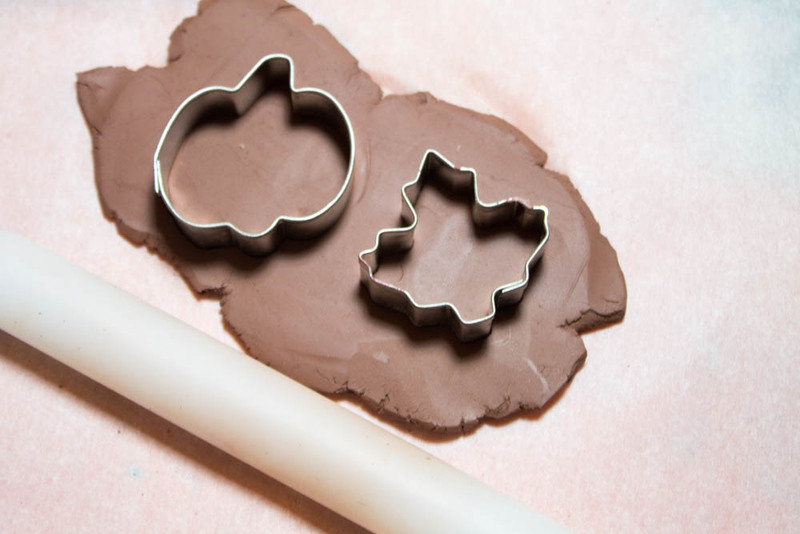 Mini-cookie cutters– I actually used pie crust cutters to cut out my fall shapes. Fine grit sandpaper– for sanding out any imperfections once charms are dry. Acrylic paint and paint brushes– I really like the way gloss or semi-gloss pain looks on these. The paint is necessary to seal your air dry clay once it has hardened. Raffia– to tie your charms to your napkins. Parchment or freezer paper– for rolling out your clay, this will keep your clay from sticking to flat surfaces. In a pinch newspaper works, but the clay does pick up the ink much like silly putty. Cut a block of air dry clay and work it into a ball. I find that keeping some damp paper towels on hand is good for keeping your clay damp. I felt that the moisture from the clay was quickly absorbed by my hands. 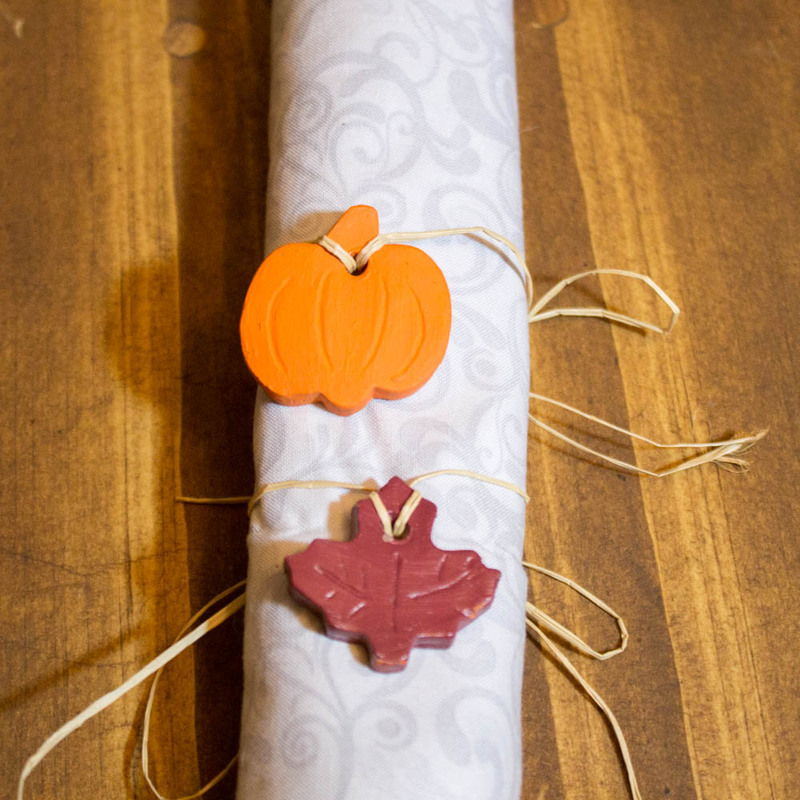 Roll out your clay with your rolling pin. I rolled mine out on parchment paper after initially using newspaper. The ink from newspaper transfers to the clay, but since we are painting the dried clay, that is fine. Make sure your clay is at least a quarter (1/4) of an inch. Otherwise the structure of the charms is brittle and crack. Place your cutters and press down. You do not need to cut all your shapes at once, like cookie dough you can re-roll your clay to cut additional shapes. With a wiggle from side to side shapes should cut neatly and then you may need to gently remove them from your cutters. I used my tools to put some lines into my shapes for detail, but this step is optional. You can also do this step after they have dried with a little moisture and something sharp. Let dry. You should allow at least 24 hours to dry, longer if you live in a humid climate. I let mine dry for several days. You can see in the picture on the right that my terra cotta clay dried a much lighter color than when it was wet. When your charms are dry, you can take fine grit sandpaper to them, particularly around where you poked the hole and the outside edges. Now it’s time to paint. I did this in two steps. I held the edges and painted the front and most of the edges, except for where my fingers were. I then laid them out flat to dry. When the front was dry I painted the back and the spots that I had left unpainted on the edges. I used two coats. Painting is necessary for sealing your charms so moisture does absorb into your finished project. When your paint is dry you can now string your charms onto an individual or several pieces of raffia that will allow you to attach them to many things. My original idea was to tie them around napkins for Thanksgiving dinner, but there are countless ways to use these great air dry clay charms this season. 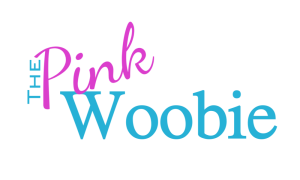 I’d love to see how your charms turned out. Tag me on Instagram or Pinterest with your finished project!